by Dave from The Longest Way Home ~ September 25th, 2013. Updated on July 16th, 2018. Published in: Travel blog » Food around the world » Nepali food. It’s a super sweet desert known all over the Indian subcontinent. I even found gulab jamun in Malaysia. In Nepal I was hoping for the same thing, what I got was quite different in many senses! Deep fried flour made with milk and sugar which is then rolled into little spheres before being soaked in a syrup. Many flavor the little spheres lightly with cardamom. In Nepal there are two types of gulab jamun. The traditional light brown one that is soaked in a sugar syrup or saffron syrup. Or this one where it’s slightly darker and given an edible silver foil topping! The red dot is simply a little food coloring to represent what I can only assume is a tikka as there were no taste differences or other colors involved. Which tastes better: silver or traditional Gulab Jamun? 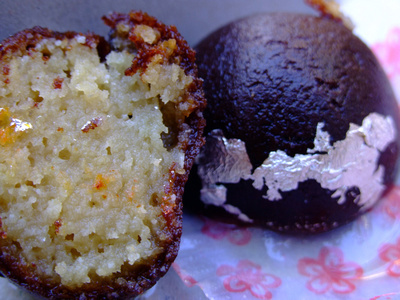 I have to give a hands down winner to traditional (Nepali) gulab jamun for this one. The silver version is very moist. But lacks that little extra flavor from the sugar syrup the traditional version has. 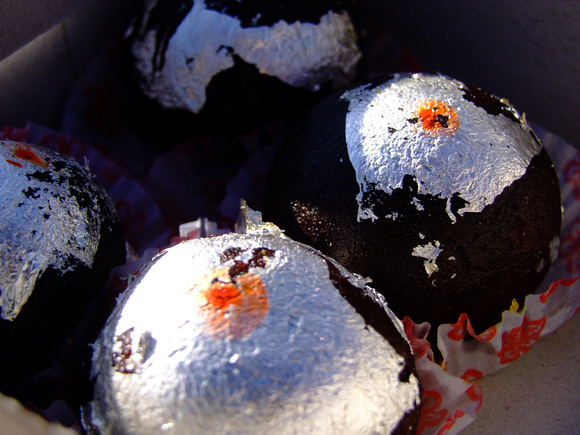 That said the silver gulab jamun in Nepal goes down a treat at a party or festival. What’s more it’s really quite cheap and makes a great gift if you are ever invited to a Nepali home. You’ll find it in many local Nepalese sweet shops and bakeries. Not so much in the touristy ones in Thamel so look inside the bakeries outside of this area. If eating at the bakery you can ask for a small dish of syrup. If at all possible try to find a chilled version of gulab jamun as it’s especially good when eaten cold. You can also get a take-away box which makes it even greater as an excellent gift or thank you present. This was one of my addictions in India. Great to see it’s alive and well in Nepal. By the way I didn’t get this delivered to my inbox as I usually do? That’s a very sweet addiction you have! Yes, apologies about the delay. I had to postpone the delivery of this post via email by a day due to a planned technical issue which has now been resolved. Great coverage again Dave. I wonder how easy would be to make these at home? Someone has to have tried! @Claire I answered via Craig as best I could! I’ve never tried. Might make a fun side project if you could find the ingredients! I haven’t tried :) I think the key is the deep frying of the flour, milk and sugar balls. Then making saffron syrup. Guess you could try Craig! I’ve never seen anything like this before. Looks just like a Christmas tree decoration!! Ha Ha, there’s no Christmas tree type celebration in Nepal, but I can see what you mean!! These sound intriguing. I’d love to try one. Consider your self protected from trolls here! I’d say gulab jamun made it’s way from India to Nepal. It’s amazing how sweets like this never caught on outside the Indian subcontinent. Everyone likes sweet things, but it never seems to have caught on. That’s a really good point Susanna. I’ve not seen Indian sweets outside of the Indian sub continent and or in Little India’s. Not sure why. Then again I haven’t seen Turkish or Mid East sweets in many places out of that region either! I cannot express how much I enjoyed your travels in thailand, the lantern festivals are an all time dream for me personally, thank you so very much for taking me traveling with you thru this blog it is amazing, thank you again!